Codemill joined MICO as an exploitation partner in the second year of the project. As digital-video specialists, we have followed the development work with great interest. There is a clear need for scalable media analysis platforms, and with time, MICO can come to fill this gap. The possibility to quickly and flexibly link chains of extractor is attractive, and so is the mature approach to metadata management. 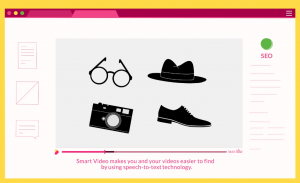 We have road tested MICO by integrating the platform in our adtech product Smart Video. Smart Video uses advanced video analytics to improve online sales, simply put by turning marketing videos into sales videos. There are several extractors that are relevant for the showcase, but we focused on the speech-to-text pipeline, as this is of central importance to us. We found that without custom training, the Kaldi version of the S2T extractor does not deliver sufficient accuracy, but that there commercial alternatives that work more or less out of the box. As stated in previous blogs, the overhead involved in integrating MICO and the extractors is not worth the time if there are only one or two extractors, but as the number of extractors grow, the advantages of MICO become more obvious.